The 4th July is nearly upon us; one of the most anticipated days of the year. Getting together to celebrate the day over a home cooked meal is integral to American tradition. College News assists you in hosting the ultimate 4th July cookout—something for the whole family to enjoy. Give the occasion some extra sizzle with our top tips on preparation, games, décor and food. The secret to hosting the ultimate 4th July cookout is to do your prep work—especially if you are catering for a large crowd. Plan your menu and make sure the ingredients are bought at least two days in advance. Take the stress out of catering by making any marinades, sauces or sides the day before. You could even do your chopping and fiddly slicing beforehand. Some people even like to dress the dinner table or seating area the night before. This way, you’ll not be rushed off your feet when the 4th comes around. In most cases, the host will know everybody who is attending their cookout and, therefore, know each of their requirements. However, in the case of larger shindigs where people will be bringing plus ones, it may be more difficult to decipher the needs of every person. For this reason, we suggest making a Facebook group for the event or even a Whatsapp group. This is a straightforward way of ascertaining whether anybody has any dietary requirements. You can also use this opportunity to see whether older or less able attendees will need help reaching the venue. Once you have done your homework you’ll be able to make the necessary additions to your plans. This may involve adding a ramp for less mobile relatives or including a vegan section, for instance, onto your menu. These thoughtful touches will ensure that all of your guests will have the best time possible. Having the same dishes at each 4th July celebration can become a little tedious. Inject some life into your cookout by recreating some of the classics. Putting a modern spin on a traditional recipe can reinvigorate it whilst keeping the essence of the original dish intact. Hot dogs and burgers may be the typical choice for such events but why not be a little different? Try making your own fish burgers; blitz any kind of white fish with prawns, chilli and a little soy and bind together with an egg. Grill on the BBQ and serve on brioche buns with a spicy slaw. Try making up some delicious kebabs with chicken and pineapple. Other delicious combinations could include zucchini and halloumi or tomato and aubergine for vegetarians. Instead of the usual apple pie, try making apple pie-flavoured ice cream served with warm cookies—perfect for anybody with a sweet tooth. The meal can be anything you make it! Whether you are planning on dining inside or outside, it’s undoubtedly going to be a scorcher. Prepare for this by making sure there are plenty of cool refreshments at your cookout. Keep a few buckets of ice dotted around so that drinks are served extra cold. 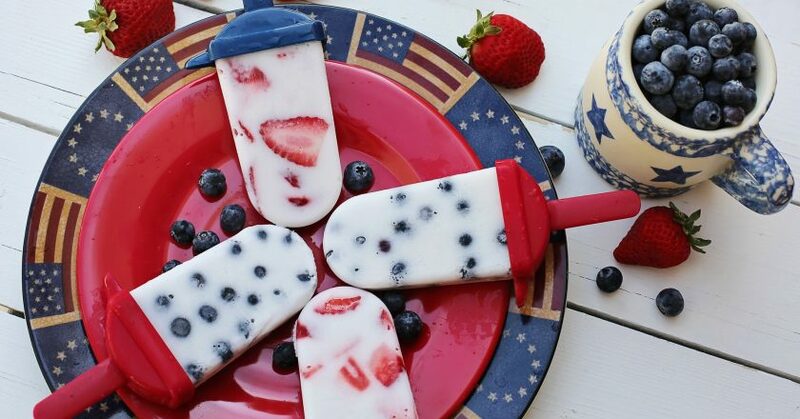 Try whipping up some ice lollies the day before; adult versions can be spiked with rum and mint while kid’s versions can be enriched with strawberry yogurt and blueberries. If you decide to host a BBQ, make sure that you provide a parasol or shaded area to retreat to when the temperature rises. You may even want to consider providing sun lotion to your guests throughout the day. Above all else, when you are planning the ultimate 4th July soiree, be creative. Think outside the box and have fun. The inventive touches that you apply to your party will mark it out against the rest. When it comes to décor, consider making your own table decorations. This can be done quite simply, at little cost. Find some pine cones, wild flowers or leaves and use them to fill a vase. Cut out place cards for your company as a thoughtful touch. To keep your guests entertained, why not supply some fun props; these are the ideal photo accompaniment. Set up a few carnival inspired games in the garden, something that everybody can get involved in. This could include a ring toss, bobbing for apples, giant Jenga and tin can knock down.